It triggered Australia’s exploitation explosion, sparked a worldwide censorship battle, and remains one of the most infamous biker movies in genre history. 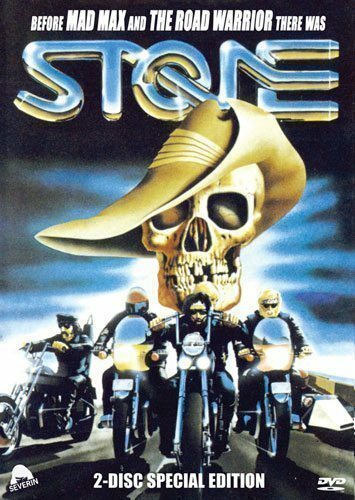 Stone is the full-throttle saga of an undercover cop (Ken Shorter) who infiltrates the outlaw Grave Diggers (led by producer/director/co-writer Sandy Harbutt) on a one-way trip to hell with vengeance in their hearts, violence on their minds, and 150 horsepower of screaming steel between their legs. Helen Morse (Picnic At Hanging Rock), Bill Hunter (The Adventures Of Priscilla, Queen Of The Desert), members of the Sydney Hells Angels, and Hugh Keays-Byrne, Roger Ward, Vincent Gil and Reg Evans of Mad Max fame co-star in the ultimate down-under cult classic, now fully restored from original vault elements. -STONE Forever – Richard Kuipers’ classic making-of documentary featuring interviews with original STONE cast and crew, and extensive footage of the incredible STONE 25th Anniversary celebration attended by 35,000 bikers in 1998.